Using page breaks is extremely easy but we need to know when or where to use them. Some like to use it in job applications and some use it in surveys. Teachers use them in quizzes and organizers use it in event registrations. The most important part of page breaks is, they shorten your forms dramatically. We all know visitors don't want to scroll too much and they want to fill out forms as quickly as possible. Why don't we make our customers' jobs easier and break pages into sections? Here are some insights we gathered using page breaks. For adding the page break, just click the "Add New Page" button in the form builder. 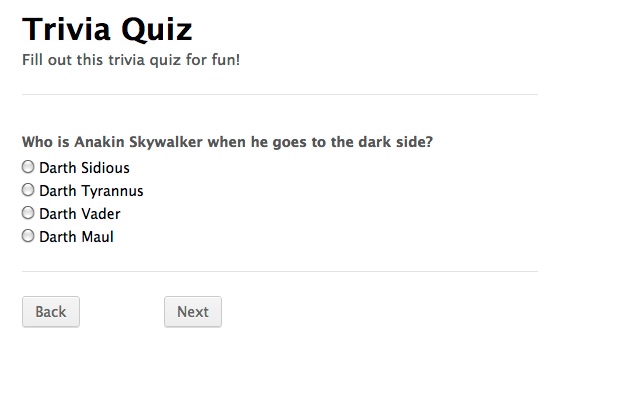 Let's look at our trivia quiz to see a page break. Although we see a back button in our first page break in the edit mode, we won't see it in the preview or when the form is live. Don't worry about it, that was done for logical reasons. That's about it for the importance of page breaks and if you want to see page breaks in action or copy the trivia quiz check it out in our form templates gallery. when I add multiple pages, on the last page i dont get the option to put a submit button - only back button is available. How can I fix that? If I delete a page, does it delete all the questions on the page or just the page break? How can I add new page and page break? I can't see those buttons in creating my form. I don't have the add new page button as above. Any suggestions? Hi I can't find the " Page Break" or the "add new page button" , how come? I have 20 pages on my form. How can I make it easy for people to go back and forth between pages? I've already tried the "tabs", but they show up in multiple rows which does not look good at all. Is it possible to save all fields on first page (ex. Name and surname, phone and e-mail) after client leaving form in second page without completing form? I'm making a multi-page application form which applicants will be able to save and come back to later. Each page has a few required fields. Currently, the form requires that all fields be completed before you can move to the next page. Is it possible to change the settings so that they can navigate between pages and the required fields only need be completed before final submission? When I preview my form, the next button takes me to the BOTTOM of the next page, not the top - how do I fix that? Why don't my page breaks translate when I save my form as PDF? Como eu faço pra adicionar uma página ao quebra páginas?? How do I tell the first page which page to go to NEXT? I don't see anything in your instructions on that? Is there a way to put a bar on top of each page to show the user which section they are on or how many steps it will take for them to finish the form? E.g. Page one personal details, page two service required etc. Ive put in a few page breaks in the list of questions I need to ask and they dont seem to be working. When I click next after filling in the first few questions it doent take me to the next lot to answer. Can you help? This is by far my favorite button feature in jotform, the page break button. If you used properly, you can create a much nicer experience for your end-users! Right on!! is there a way to use page breaks and embed a submit button in multiple different page breaks, having each submit only email its corresponding pages info?. I know this can be done using multiple forms, and free form text links to the forms, I just thought it would be a nice clean way to create great multi level forms. You know, in the last 30 minutes I've made more progress than I have with the first 10 wp form plugins (doing a wp.org plugin search), and other form builders. On top of the fact that you guys have some pretty bomb documentation and insight to form creation... I'm definitely hooked on JotForm. My pagebreaks are causing my forms to end. In other words, when testing my form, when I get to the pagebreak and I click next, it is taking me to the captcha and submitting the form. How can I resize the page break buttons to extend the full form width? Is it possible to let users move to the next page even if the required fields are not filled? Can I name pages to make conditions easier to set. How to add security seal to bottom of every page in multi-page form? How to create a Multi-page Form? How create a form with many pages ?